the spirit of the place, all that which this place represents, living and feeling; its soul. 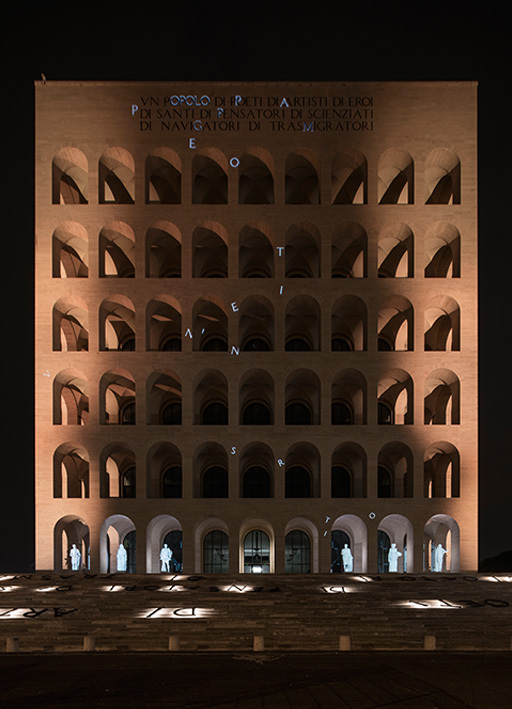 the light poetry of mario nanni’s ‘genius loci’ is a tribute paid to the palace of italian civilization and its metaphysical spirit capable, through light, to become a home: the new headquarters of fendi’s fashion house. as the latin said: ‘nullus locus sine genio’ (there is no place without a spirit); no place has a soul without light. each place earns itself its spirit through its own history, the settling of emotions and lives lived, through the actions of the people who live in those places, through the materials that characterize them: the palace of the italian civilization, in its metaphysical and silent authority, with its material and majestic presence in the roman landscape, stands out as a symbol of the magnificence of rome, as the banner of ‘italianity’ in the world. 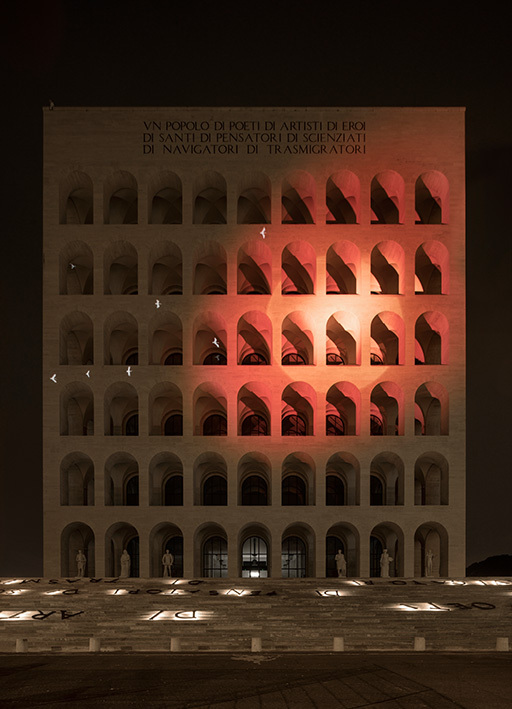 the most important work built in rome over the last century, the perfect expression of the italian cultural vanguard of the twentieth century (designed by young architects giovanni guerrini, ernesto lapadula and mario romano), becomes a headlight and a monument of the expressive capacity of rome even in the darkest of nights thanks to the light integrated in the travertine arcades, and also becomes an open theatre thanks to the work that mario nanni, the master of dark and the poet of light, completed for the official opening of the new fendi palace. 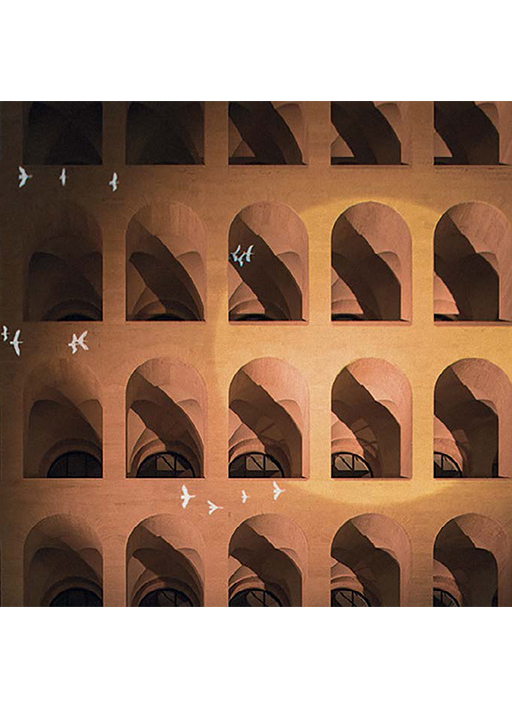 genius loci is the result of a long, slow and conscious process of acquaintance with the place, the materials, the light and signs of the present and of a possible future nature of the site. 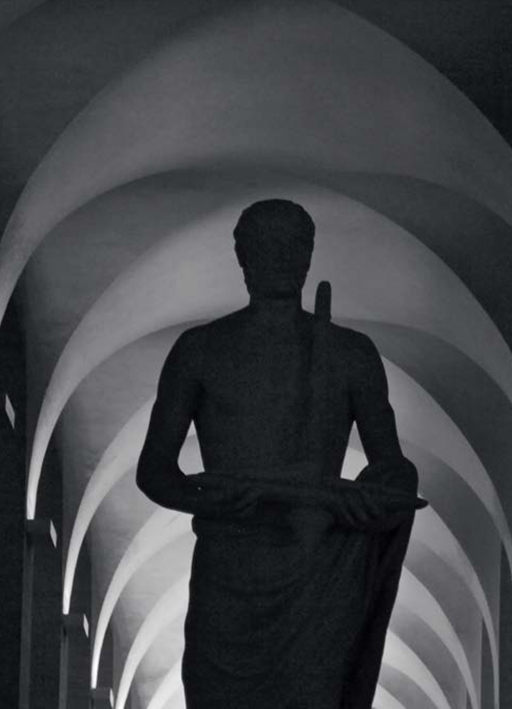 it is a path that is being transformed by light from an individual into a collective place, where the essential element is the re-construction, within our memory, of history: the invisible that is behind the place and the visible, which allows us to establish a closer contact with the essence and existence of the architecture. 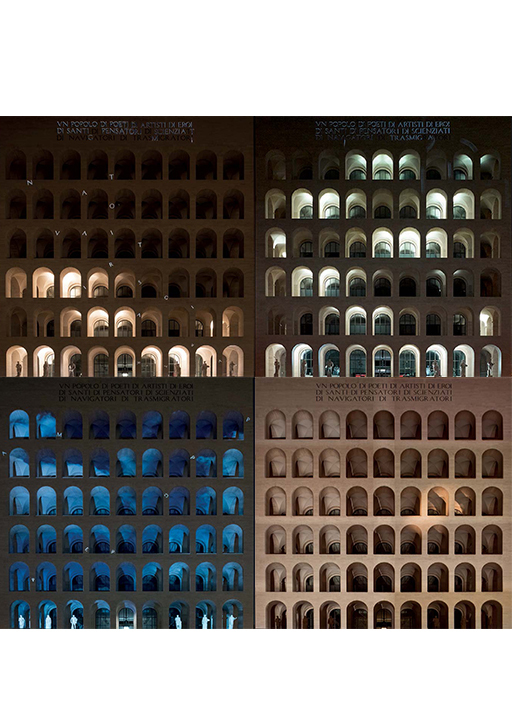 mario nanni’s light originates from the colours and renaissance perspective, as well as from metaphysical painting: to show what cannot be seen, to highlight details, to create the experience of an epiphany in the onlooker… to discover that which has always been looked at without being observed. this is why it is called a ‘poetry of light’: because it is a story being told, the plot of a place through its light. the storytelling starts from the lower part of the structure, as if growing from the soil up towards the sky. the dawn of a new day is rising, a new page is opened. the golden red of the sunrise lights up the monumental staircase, the long and slow ascent to the palace. the sun, as if marking the passing by of time, changes its colours until it reaches the white light of noon. an intruder appears during its ascent on the left, slowly plodding along: it is a bird that got lost during its flight. he left its flock to be a pioneer of a long journey, carrying the slowness and heaviness of the fatigue of the one who cleaves the air first, who looks far away and is not afraid of heading towards the sun. it is the symbol of challenge and freedom of thought, the personification of the virtues depicted on the façade of the building. a flock follows behind and reaches it until it fills up the surface of the white sun and everything goes dark again. this is how the artist celebrates the ancestral human need to conquer a place and make it somehow eternal. 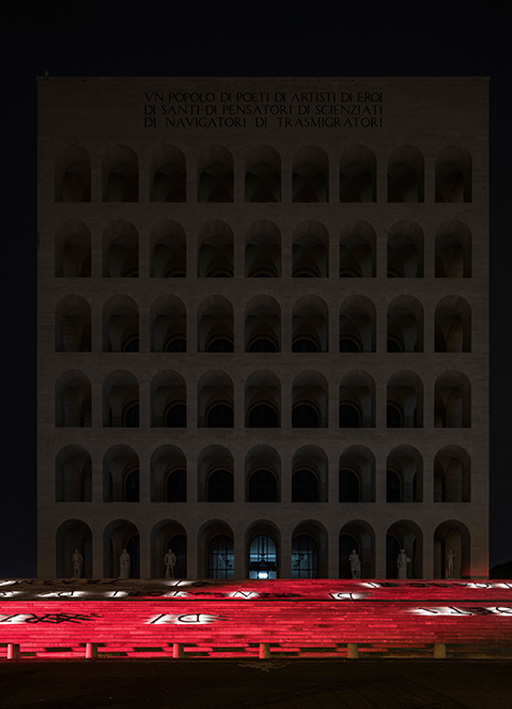 hence, we can today take part in the primeval act of the birth of a new city (monument), abode and cradle of the italian know-how of which fendi embodies the highest values. 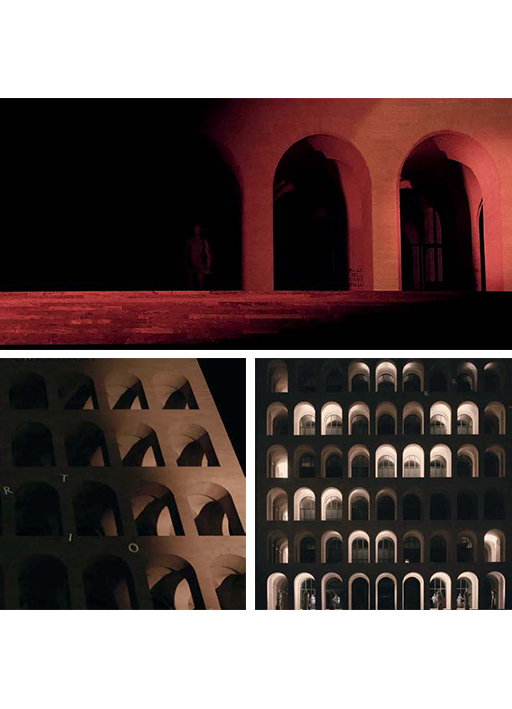 and after the dark, light appears again again - an architectural light, though, designed and conceived for that specific space. a light that highlights the raw material of the product and emphasizes its different perspective views by showing the prospective strength of the open gallery, just like light in renaissance paintings. it is an artificial light that does not look for a dramatization, but bears in mind the lesson learnt from the natural sunlight by highlighting shadows and emphasizing backlight. 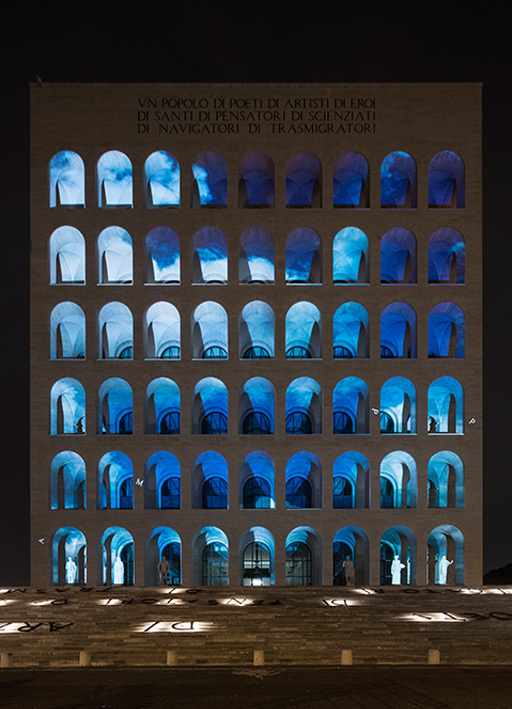 the ‘mystical’ arches created as a symbol of the italian civilization become unexpected containers of light and fulfil their original function of glorifying art, literature, science and italian history. 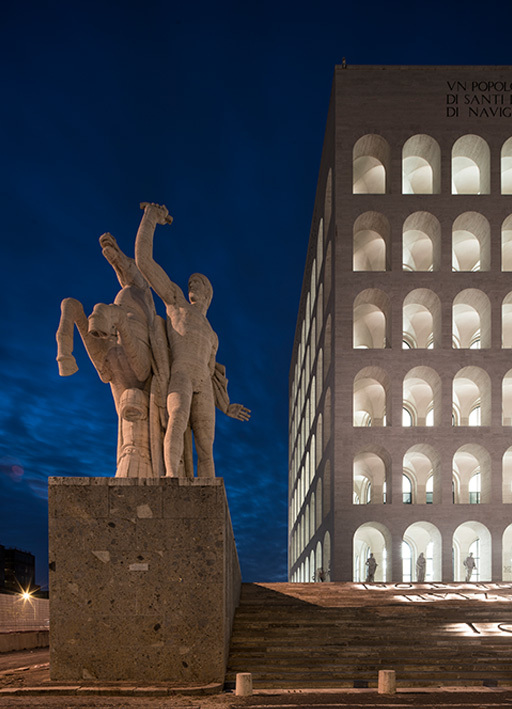 the architectural rhythm of the arcades is marked, at the entrance, by the majestic presence of statues, allegories of the virtues of the italian people: a light dedicated to them and specifically studied with a colour temperature of 5,000 k to highlight the pure white of the carrara marble with which they have been built, sheds light on them frontally, one by one, helping the spectator to identify their name and symbolism. 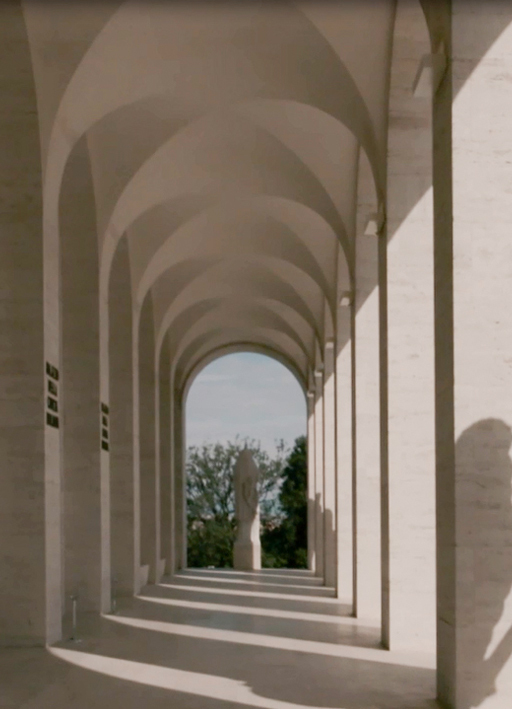 mario nanni’s light story restarts precisely from this point, where the italian virtues are magically revealed in a sequence. the white light on the white stone of the iconography of painting. a glare of light after complete darkness. 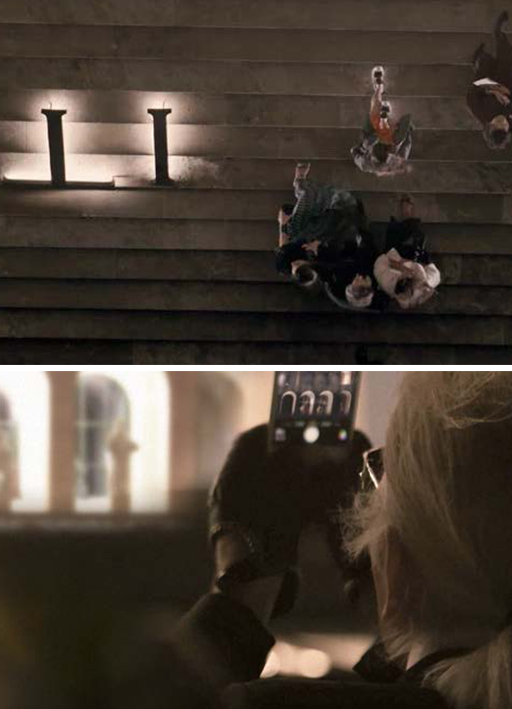 a small letter is created - a ‘p’ that moves from the painted statue and parades along the levels of the palace to reach the summit and stop on the ‘p’ of ‘pensatori’ (thinkers). 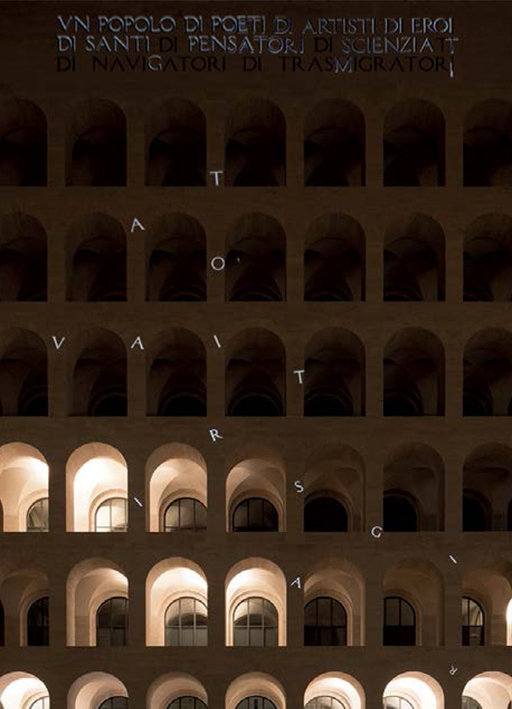 dancing lights start connecting the entrance floor level, giving life to the statues, to the top of the façade that shows the famous sentence that identifies the virtes of the italian people starting with the letter ‘p’, the statue of poetic genius, to pass to the word poets; from music, the letter ‘m’ fluctuates until it integrates in the ‘m’ of trasmigratori (migrants); the letter ‘a’ originates from the statue personifying the craftsman and then highlights the word ‘artists’; from the statue of the heroic virtue to the word eroi (heroes), from the ‘g’ that originates form the statue of war genius until the ‘g’ of navigators, in a flow of lit up words that goes from the bottom to the top and illuminates the façade of the monument by points and constellate it as if seized by the light of the stars… until it lights up the whole wording engraved on the virtues of the italian people: pride, awareness, willingness of belonging to a people with many virtues. it is also an invitation to think about how to preserve and liven up these skills inside and outside the palace. 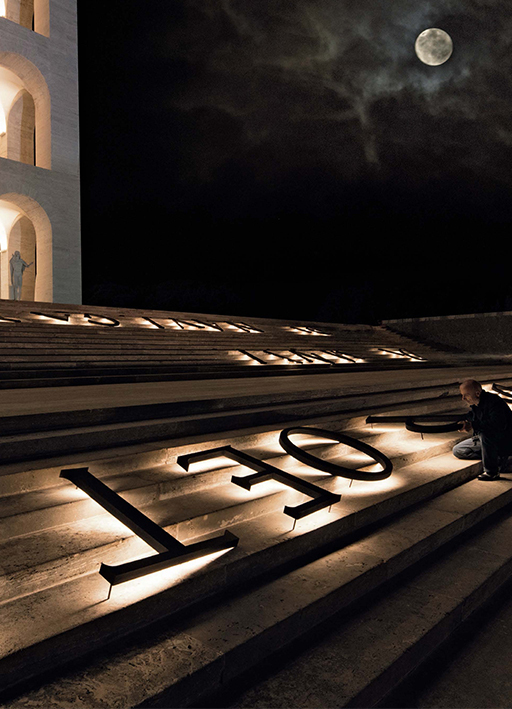 a pause of seven seconds is devoted to this reflection: in the dark night, light is placed only on the wording. its 87 letters have magically fallen down as falling start and rest on the staircase at the entrance of the palace in an untidy arrangement. a shadow of light lights them up not only to allow for their reading, but also to be slightly touched by those who are about to enter the building and experience, through this ascent, the many folds of their meaning. the noise of a lock closes the show and opens up the palace. light is spread again around the palace: let us give back life to the palace based on the memories of the virtues that have built it up.